U.S. Commerce Secretary Wilbur Ross (C), a member of the U.S. trade delegation to China, leaves a hotel in Beijing, China, May 3, 2018. A high-level U.S. trade delegation has begun talks with Chinese officials in Beijing as Washington tries to address deep concerns about China’s economic policies. The meeting is seen by some as a positive step, as the two sides attempt to avoid the possible outbreak of a trade war. Analysts say it is unlikely their differences will be resolved during the meetings but a decision to keep talking would be welcome progress. President Donald Trump said on Twitter U.S. officials are "trying to negotiate a level playing field on trade." Raymond Yeung, a senior economist for Greater China at the Australia and New Zealand Banking Group, says if the two sides can at least agree to keep talking with each other that would be big progress. Differences over trade policy and market access have been a persistent concern for the United States and other foreign investors in China. In recent weeks, the debate has become even more heated with President Trump threatening to slap a long $50 billion list of tariffs on Chinese goods to punish Beijing for what his administration calls its unfair trade practices: forced technology transfer, intellectual property rights and state subsidies for technology development. Beijing has denied Washington’s accusations and insists its market is opening. It recently pledged to do away with a 25 percent tariff on imported foreign cars, albeit by 2022. The Chinese government has also responded with threats of its own, saying that if the U.S. presses ahead with tariffs it will respond in kind. The seven-member U.S. delegation is led by Treasury Secretary Steven Mnuchin and is meeting with a group of Chinese officials led by Chinese Vice Premier Liu He, a close aide to China’s president, Xi Jinping. 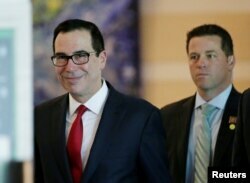 U.S. Treasury Secretary Steven Mnuchin is seen as he and a U.S. delegation member for trade talks with China, leave a hotel in Beijing, China, May 3, 2018. Although it is difficult to predict how the meetings will turn out, Liao Qun, chief economist at China CITIC Bank International, says it is a positive sign that both sides have a desire to sit down and negotiate. How much can be accomplished, depends on Washington, he says. 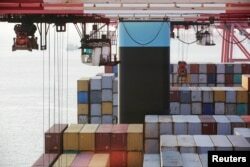 FILE - Containers are seen unloaded from the Maersk's Triple-E giant container ship Maersk Majestic, one of the world's largest container ships, at the Yangshan Deep Water Port, part of the Shanghai Free Trade Zone, in Shanghai, China, Sept. 24, 2016. Since Xi Jinping rose to power in 2012, China has taken big steps to increase the central government and the communist party’s control over the economy and business, even as Beijing pledges to continue to further open its markets. In 2015, the government unveiled a key policy plan called Made in China 2025, a plan that aims to make China dominant in 10 major next generation industries from robotics to electric cars, artificial intelligence, bio-tech and aerospace, among others. An investigation by the Trump administration into China’s unfair trade practices mentions the policy more than 100 times. The policy clearly sets goals for domestic industries to dominate over foreign players in the Chinese market and globally. Beijing has characterized President Trump’s threats to tax exports and attack the government’s policies as an attempt to contain China and force the Chinese market to become more open, something that officials and state media have repeatedly stressed will never happen. Bridging such a huge gap during two days of talks will be difficult, says Christopher Balding, a professor at Peking University’s HSBC Business School. “I would be somewhat surprised if there was any real change in the negotiating stance of either party. Specifically China, they don’t want to open their markets, that’s the fundamental point,” Balding says. He says the best that could be hoped for is that the two can find enough room to compromise to not go forward with the trade war. But these disputes are unlike any other in recent history, he adds. “This is about how disputes are settled: About how one country views the international system as compared to the other. This is about how one country views how a country should be run and how they have conflicting views of those two things,” Balding says.